I’ve come to realize that however you teach, by whatever methodology you subscribe to, there are two skills that form the basis of all science learning. More than any other skills, and there are many that range from important to critical, without the ability to observe and wonder it’s impossible to learn science. There’s something reassuring about that. Because everyone, and I mean everyone, can observe and everyone can wonder. Our challenge is to give them the tools and the experiences to become better observers and better wonderers. The best pair of tools you can use to build these two essential skills are a T-chart graphic organizer and an anchor chart for observations. The T-chart is simply two columns labelled Observations and Wonderings as shown here. While the construction of the chart is simple, filling it in requires a deep understanding of what makes a good observation. I think educators constantly assume students can observe, but for most student’s the ability to observe is limited. Just because we can see it, doesn’t mean we can describe it. To help build the skill of observation, at any age, I suggest using the following Making Good Observations anchor chart. This chart was developed by my colleague Sandra Mirabelli (@SciLitSandra) for our workshops on integrating Science and Literacy. You’ll see from this image that the chart is hand printed. I think this helps add to the authenticity and importance of the words on the paper. By having this posted in your classroom your students have a learning-aid that reminds them of the characteristics of a good observation. Now take any demonstration or activity you do in class and use the T-chart. I like the egg in the cup demo or the Water Drops on a Coin After students fill in the chart, have them work in groups to find the top three observations. For the first few times be tough on the kids as you review their work. While they’ll get the wonderings with little difficulty, there will be many challenges on making good observations because they’ll confuse observations with inferences. While inferring is another critical skill in science, the focus for now is on making good observations. This may also be a spot to stop and ask yourself what is the difference between an inference and an observation. 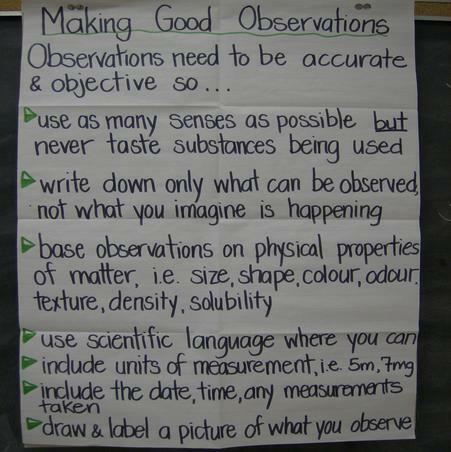 When I do this with educators attending my workshop, I focus on the Making Good Observations anchor chart. All observations have these qualities. By making connections between good observations from your demonstrations and their T-Charts, your students can learn how to make better observations in the future. And this is the critical skill for any future skill development. Finally, to help with future skill development, have students write each of their observations and wonderings on separate Post-It notes. Now you can collect the good ones and place them on a class T-chart and use an exemplar. Eventually you will find yourself in a rather in-depth discussion about the difference between observations and inferences. And that point, you’ll know you’re on the right track to developing both observation and wondering skills!